The commercial end of 3D printing is going in many different directions and there are a few big players in this global innovation segment. While some focus on office systems that enable engineering firms and design studios, others seek to provide new manufacturing alternatives and possibilities. The following companies are blazing the exciting and lucrative trails of professional quality 3D printing. 3D Systems has perhaps the widest breadth of technologies in the 3D printing space, and their portfolio includes some of the best known and well respected personal and professional printing systems. Their commitment to making additive manufacturing more available has proven a worthwhile endeavor, as some of their products have become household names. The people at 3D Systems want you to create your creations, so beyond offering the physical printing systems, they also offer CAD software and content development support. The ProJet series includes professional and personal models. The personal models start at around $15,000, printing in color. The professional end of the ProJet series is incredibly wide and diverse; these models are ideal for prototyping, concept communication, and certain configurations can handle short production runs. ProJets can have rather large build volumes and some can be made to operate for several days without human interaction. ZPrinters make up the remaining portion of the 3D Systems professional lineup. These printers produce monochromatic and color creations. Creativity is unrestrained with the multicolored and quick printing these systems provide. ZPrinters, like ProJets, are intended to be office workhorses that are under near constant operation, producing beautiful content every time. If you want to produce large objects or objects in mass, the 3D Systems solutions to consider are called iPro, sPro, and voxeljet (North American distributor). The iPro series uses stereolithography (SLA) technology to produce extremely smooth pieces. The sPros use Selective Laser Sintering (STS) to do something similar, but faster and bigger; the sPro line also makes use of Direct Metal Selective Laser Melting (SLM), which can manifest medical and aeronautical grade metal stuffs from Cobalt to Titanium and steel. Whether you need rapid prototyping or rapid manufacturing, 3D Systems has a solution or several. 3D Systems also offers prototyping and manufacturing services through 3Dproparts and Quickparts, as well as an array of digital models through various directories like Vidar and The 3D Studio. As covered on the Personal Printers page, 3D Systems also produces several desktop printers, including the 3DTouch, Botmill, and Cube. Clearly 3D Systems is penetrating many markets. Stratasys was founded in 1989 and is headquartered at Eden Prairie, Minnesota. They produce 3D printers that are capable of rapid manufacturing, rapid prototyping, and DIY 3D printing in high definition due to their patented Fused Deposition Modeling. Offering a full line of machines including desktop, office, and factory models, their customer base is wide, large, and growing. Stratasys desktop printers include the uPrint and Mojo. Both series use WaveWash systems to dissolve supports in a water-based solution. These printers are ideal for small design studios and companies with basic prototyping needs, as they’re low cost and produce quality models. The Dimension series is the hallmark of Stratasys printers and has entered many professional offices. These printers can produce larger models at even greater detail than the desktop models, and use the same WaveWash technology for support removal. Dimension printers are best suited for engineering firms that need accurate models for testing purposes. Objet is a 3D printer manufacturer that merged with Stratasys. Before that Objet distributed their own desktop and office systems that are affordable and professional. Their Eden series has exceptional resolution and is intended to be very cost effective. The Connex line is where Objet really shines though as it can print pieces in 14 materials at once from a choice of over 100 sturdy, rubber like, clear, and colorful materials. As far as variety of possible objects that can be produced, Objet is a heavy contender. Solidscape presents a line of Stratasys systems specially designed for producing high resolution castings which are commonly used for dental implants and intricate jewelry, as well as components for electrical devices. These printers generally use, but are not limited to, wax as their printing material. 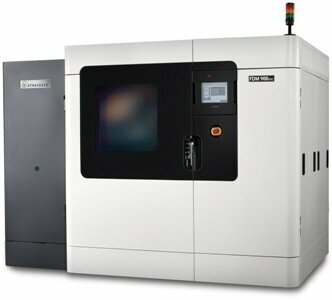 Fortus completes the Stratasys portfolio with 3D manufacturing solutions. This series has the largest build envelope and is designed for repeated prints that are very rigid. Fortus printers are intended for producing tools, jigs, and end-use products. A Finishing Touch Smoothing Station is also offered, and makes models up to 15 times smoother. RedEye offers professional printing services through utilizing over 500 machines using Stratasys technology. Whether you need prototypes or volume orders of parts or end-use products, they’ve got you covered. Headquartered in Germany and founded by electrical, optical, and mechanical engineers, EnvisionTEC is a manufacturer of professional grade printers focused on cost effectiveness and they sport the Perfactory (personal factory) line. These systems incorporate Texas Instruments DLP technology to achieve very fine levels of detail for applications such as dental and ear molds, and this DLP tech lends a special quickness to these printers too. EnvisionTEC offers desktop and office versions of Perfactory printers, so their products can scale with you as your business grows. What really separates EnvisionTEC from the crowd is their 3D-Bioplotter, which is designed to print scaffolds from biomaterials! A common theme in the founding of 3D printing companies is an emphasis on democratizing accessibility to additive manufacturing, and there Mcor Technologies is no different. Founded by a couple of highly experienced mechanical engineers, Mcor meets the challenge of efficient 3D printing with the Matrix 300+. What’s special about the Matrix is that it uses paper and a water-based adhesive to create its objects, so it’s a more eco-friendly process than many others. Similar to Mcor’s method of stacking layers of paper, Solido3D uses layers of PVC and a special adhesive to create physical objects. The models from the SD300 Pro are rather rigid and can be used to test fits and the workability of mechanical parts. These systems are ideal for R&D purposes as the creations are functional but unattractive compared to that of competitors, but they’re supposedly also more affordable to operate. When it comes to affordable professional printing though, Asiga makes an impression. This is a small group of creative minds made up of designers, programmers, and engineers trying to do their part in increasing the accessibility of high quality 3D printing. Considering all of their models are under $10,000, they seem to be accomplishing their goal. Asiga calls their printers the Freeform Pico and Pico Plus, where the Plus delivers larger pieces with greater detail. What’s important to note is that these are desktop sized models that produce professional resolution prints by using a patent pending “sliding separation” method, so they’re ideal for dental fixtures, jewelry, and even gears. In Europe, but serving the globe, is voxeljet. voxeljet offers systems and services, with their systems ranging from the copy-machine sized VX200 to the room sized VX4000 with a build envelope of 4 x 2 x 1 meter, and has continuous print capability, as do some of their smaller printers. With such large build volumes, batches of objects are entirely possible. The materials available are from high-resolution plastics and silica sand that’s ideal for later metal casting. Their services include runs of sand and PMMA prototyping and production runs, as well as casting in aluminum, steel, copper, and other metal alloys. 3D Systems is the North American distributor of voxeljet. The German company EOS was founded in 1989, and they’ve been delivering quality ever since. EOS uses Laser Sintering for producing ergonomic objects in plastic, sand, and with the EOSINT M 280, even metals for tooling, prototyping, and end product runs. As well, EOS also employs Micro Laser Sintering for projects that require extra-fine precision, like medical equipment and electronics. With these technologies EOS serves several major markets, including aerospace, medical, tooling, and automotive. Training, maintenance, and software are also provided. With the vision of revolutionizing the art of manufacturing, Arcam was incorporated in 1997, and is headquartered in Gothenburg, Sweden. Arcam’s Electron Beam Melting (EBM) method took years to develop; taking place in a heated vacuum, the process involves melting metal powders a layer at a time with an electron beam and creates parts that are mechanically and chemically sound. With the Arcam A2, these parts can be quite complex, made from Titanium, steel, Aluminum, and even Beryllium, and are used in aerospace and defense, medical applications, and industrial settings. Arcam manufactures and distributes their EBM machines and metal powders. Whether for increased performance or reduced fuel consumption, the aerospace industry is highly concerned with weight reduction, so 3D printing is ideal for producing sturdy parts with intricate geometries. From passenger planes to ballistic missiles, Arcam supplies the means to print reliable internal components and external housings. Their EBM technology allows the production of high-resolution, light-weight materials with advanced lattice structures that cost significantly less than those produced conventionally. devices with the Arcam A1. With implants, rapid production is important for testing, as well as completely customizable shapes, densities, and porosities; this is where EBM shines. Arcam’s trademarked Trabecular Structures can be created in one print, varying from solid, porous, or a combination of both, and can emulate bone flexibility. Appropriate porosity ensures effective osseointegration, and adjustable pore geometry and size maximizes control. Such pieces have been used in hip, shoulder, and spinal implants. Arcam also does a lot of R&D on additive manufacturing and the academic world has been applying EBM to material characterization and powder metallurgy. ExOne was founded in 2005, spun off of the Extrude Hone Corporation to focus on 3D printing and micromachining. With machines like the S-Max that can print sand objects as large as 1800 x 1000 x 700 mm and the M-print in metal at 780 x 400 x 400 mm, ExOne has vast capabilities. ExOne even has machines that print in glass (M-Lab). Their Digital Part Materialization takes digital files all the way to useable components for cooling and porting functions, and prototyping and short production runs. With Orion short pulse laser manufacturing they can also handle micromachining. Services all also offered, from training to materials development to casting. The inventors and manufacturers of the World’s first affordable high resolution 3D printer, the Freeform Pico. envisionTEC develops, produces and sells Computer Aided Modeling Devices (CAMOD), including hardware, software, and materials. We offer innovative solutions in Solid Freeform Fabrication for end users. This German company uses Laser Sintering for producing ergonomic objects in plastic, sand, and with the EOSINT M 280, even metals for tooling, prototyping, and end product runs. As well, EOS also employs Micro Laser Sintering for projects that require extra-fine precision. ExOne is fouced on 3D printing and micromachining. With machines like the S-Max that can print sand objects as large as 1800 x 1000 x 700 mm and the M-print in metal at 780 x 400 x 400 mm, ExOne has vast capabilities. ExOne even has machines that print in glass (M-Lab). Fortus 3D manufacturing systems are the industry standard for 3D engineering. Using the Stratasys pattented FDM technology, FORTUS 3D systems, deliver precision manufacturing output. Mcor’s mission with the Matrix is to bring 3D printing to the masses and to make 3D printing as easy as printing on paper. The Matrix 300 has a new sleek design with an improved user friendly interface making 3D printing easier than ever. Objet Ltd. is a leading provider of high quality, cost effective inkjet-based 3D printing systems and materials which are ideal for any company involved in the manufacture or design of physical products using 3D software or other 3D content. In 2012 they merged with Stratasys, creating the largest 3D printer company in the world under the symbol SSYS. Cubic makes the SD300, an office-friendly, network compatible printer that allows you to build your 3D models right at your workstation. Solidscape is the leading manufacturer of high-precision 3D printers, materials and software for Rapid Prototyping and Manufacturing, able to print solid models designed in CAD. Stratasys invented and patented FDM, Fused Deposition Modeling. FDM technology has led to 3D prototyping and 3D printing, which enables users to create 3D prototypes and real end user parts. voxeljet offers systems and services, with their systems ranging from the copy-machine sized VX200 to the room sized VX4000, and has continuous print capability, as do some of their smaller printers.